Crew Chief/HP Umpire Joe West and All-Star Game umpires Angel Hernandez (1B), Mark Carlson (2B), Chris Conroy (3B), Manny Gonzalez (LF), and Mike Estabrook (RF) take the field in Miami with Replay Official Doug Eddings stationed at MLBAM headquarters in New York as we open the floor for 2017 All-Star Game discussion. Notes include home plate umpire performance according to pitch f/x and UEFL Rules 6-2-b-a (horizontal bound, "Kulpa Rule") and 6-2-b-b (vertical strike zone, "Miller Rule"). Plays include significant plays, if such plays occur. - 7/11/17, AL@NL: HP Umpire Joe West: pfx. 107/110 Balls + 45/47 Strikes = 152/157 = 96.8%. +3 NL. 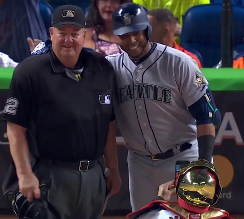 - Nelson Cruz brings cell phone to at-bat, asks Yadier Molina to take a photo with Joe West. UIC Joe West: 10th, .750 RAP (9 Affirmed / 12 Total). U1 Angel Hernandez: 60th (.400), 4/10. U2 Mark Carlson: 34th (.583), 7/12. U3 Chris Conroy: 65th (.333), 4/12. U4 Manny Gonzalez: 73rd (.300), 3/10. U5 Mike Estabrook: 35th (.571), 4/7. AL Manager Brad Mills (CLE): TSP = . 522 (12/23) - T-15th. CSP = N/A (No Challenges Filed). NL Manager Joe Maddon (CHC): TSP = .559 (19/34) - 3rd. CSP = .594 (19/32) - 3rd.